At the College of Merchandising, Hospitality & Tourism (CMHT), we are the innovators, dreamers, and go-getters of the future. Having seen many changes over the course of nearly 110 years of existence, CMHT’s degree programs and extracurricular activities reflect a long history of creative thinking and globally-oriented problem solving. Our seasoned, industry-savvy faculty and staff work to provide the most unique, rewarding student experience through hands-on, intensive courses in the Consumer Experience, Digital Retailing, Hospitality, Fashion, Merchandising and Tourism fields, as well as extracurricular clubs and career expos. We are home to the first ever, ACPHA-accredited Hospitality program, the first Digital Retailing B.S., and the nation’s largest Merchandising program in the nation. At CMHT, we don’t just provide experience—we build leaders. CMHT challenges you to find your niche! The mission of the College of Merchandising, Hospitality and Tourism is to transform learning, research and engagement for a global experience economy. Our vision is to lead the paradigm shift in learning and research of digitally networked, sustainable and socially responsible products and services for empowered consumers in the global economy. What started as the Department of Domestic Science within the School of Education in 1910 soon became Home Economics, serving as the framework for the merchandising, hospitality, and tourism management and digital retailing courses we offer today. When the Domestic Science Department—dedicated to the study of household skills—was first established in 1910, the world as we know it was a drastically different place. In 1914, the Home Economics Department was established in Domestic Science’s place. 5 years later, the first college degrees were offered (1919). The first B.S. in Home Economics was administered in 1921, the same year the Department opted to add a vocational certificate in Home Economics, while also implementing a child development course. It wasn’t until 1937, however, that the first Master’s degree in Home Economics was awarded. In 1938, Dr. Florence Scoular was named Department Head of Home Economics. 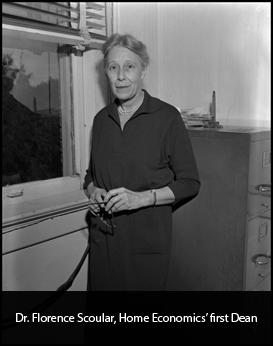 By 1941, she had become the department’s first ever director, and oversaw the transition of the Department to the School of Home Economics in 1946, becoming its Dean that same year. In Dr. Scoular’s time as Dean of the School of Home Economics, she was revered. She helped to expand the School to include Foods and Nutrition, Home and Family Life, and General Home Economics. These programs were a sign of what was to come, and marked the first transition to Hospitality and Merchandising. 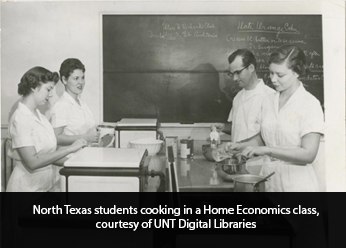 In 1961, Dr. Scoular saw Home Economics move to the Education-Home Economics building in 1961 (now Matthews Hall). Here, cooking labs were opened for students. Dr. Scoular retired in 1968 and died in 1972, but her legacy still lives on at UNT. The 80s were a whirlwind for UNT—then North Texas State University (NTSU). 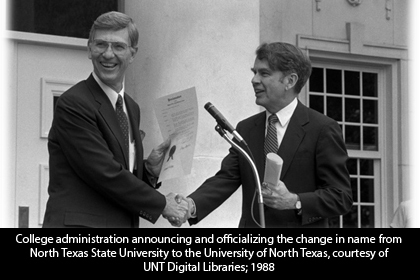 Its name change in 1988 to the University of North Texas stemmed from the need to change with the times—a trend started by CMHT. And it all began with a task. In 1984, the School of Home Economics’ dean, Dr. Suzanne LaBrecque, was tasked with tracking down industry support to build connections with local hotels and restaurants. Never having taken a business course, LaBrecque, with the help of Chancellor Hurley, successfully established connections that are still in place today. In 1985, the hospitality program was established under the name Hotel/Motel and Restaurant Management. At the end of Winter 1986, a name change for the college of Home Economics was approved—and the School of Human Resource Management was born. It was here that the clear distinction between merchandising and hospitality was established—as the school was split into 3 divisions: Clothing & Textiles, Hotel/ Restaurant Management & Nutrition, and Child Development, Consumer Economics/Home Economics Education. "We needed a name to reflect these changes and to give us focus for the future,” said Dean Suzanne LaBrecque, Ph.D., in a 1986 interview with The North Texan. “We are keeping up with the times very well, and our name needs to reflect this. We have thought and planned a long time for this name change." In 1992, a proposal to change the school’s name served as the official, titular beginning of the School of Hospitality and Merchandising Management. 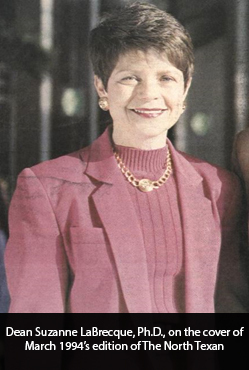 In 1998, Dr. LaBrecque became Vice Provost and Associate Vice President for academic affairs at UNT. Dr. Judith Forney was soon named the Interim Dean for the School of Merchandising and Hospitality Management, and became the School’s official Dean in 2001. In her time as Dean, Dr. Forney has been responsible for the most significant transformation of Merchandising and Hospitality, establishing a 100%-online graduate program in Merchandising, overseeing the first ever Digital Retailing degree program’s implementation, and championing the official transition of the School to the College of Merchandising, Hospitality and Tourism in 2012.